Healthy Girl Cocktail – Week Four What’s in The Box? CUKES, CUKES AND MORE CUKES! I have to thank my friend Joanne, as well as the abundant cucumbers in the box, for the cucumber cocktails that I have been enjoying all summer. She turned me on to this incredibly clean, crisp, pure and refreshing tasting vodka, with the essence of freshly sliced cucumbers. 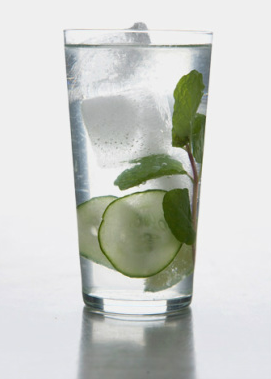 With the crushed up crunchy cucumber, a little seltzer, and a squeeze of fresh lime, I actually feel healthy drinking this! Remember, if your diabetes is not in good control you should avoid drinking alcohol. If you do choose to drink, make sure it’s not on an empty stomach. Additionally, alcohol can cause hypoglycemia – particularly if you use insulin, so you’ll need to check your blood glucose more frequently. This wonderful low calorie vegetable indeed has more nutrients to offer than just water and electrolytes. It contains unique anti-oxidants in good ratios such as B-carotene and a-carotene, vitamin C, vitamin A, zea-xanthin and lutein. They also have a mild diuretic property due to their high water and potassium content, which helps in checking weight gain and blood pressure. I was surprised to learn they have a high amount of vitamin K which has been found to have a potential role in bone strength and in the treatment of Alzheimer’s disease! Muddle mint and cucumber in bottom of a shaker glass. Add vodka, soda and lime juice. 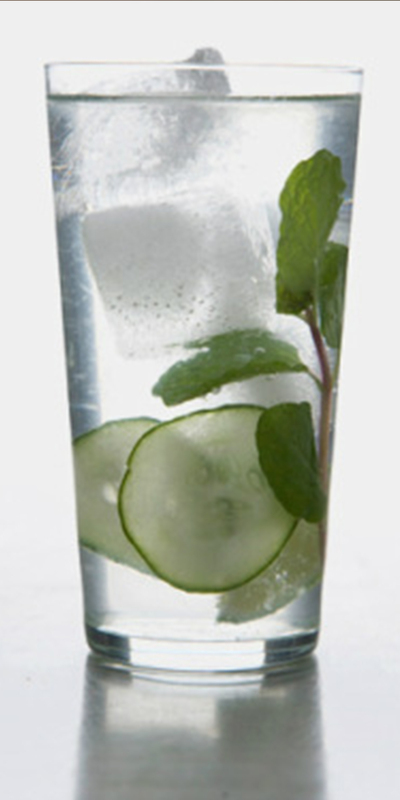 Strain and garnish with a cucumber slices and mint. Add more ice and serve! 100 calories, 0 fat, 25mg sodium, 2g total carbohydrates, 1g sugar. So if you feel like indulging, this is the way to go!! You could also add a little beet juice, green tea or agave if you like, but that would change the nutritionals. So what did I do with the rest of the box this week? I roasted the cabbage in the toaster oven with a spritz of olive oil and pepper (I loved it this way), added the potatoes to a pasta dish, made tomato salad and ate the sweet tender baby watermelon alone. I only allowed a piece or two for my husband. Ha! Next week I am thinking of a watermelon gazpacho and I will have to think of something to do with all these tomatoes! !